The winner of the £50 voucher is Emily Like from Hay-on-Wye. New competition coming soon, so watch this space! Horse Boutique have generously offered a £50 voucher to be spent at the Horse Boutique. It can be used in store, or by placing an order over the telephone. The voucher can not be used for feed or bedding. All you have to do to enter is answer the question correctly. The entry form and question can be found below. The Horse Boutique, Master Saddlers, is a family run business, based in Kingsland, Herefordshire, it has served the local area and border counties since 1964. The qualified team is passionate about supporting both horse and rider and are always happy to help. All of the products on their new website, and in the Kingsland shop, have been chosen because they offer the best quality and value for customers. Brands include Charles Owen, Harry Hall, Champion, Ariat, Albion, Ideal, Racesafe, Point Two, Toggi, Woof Wear, NuuMed and Le Chameau. Michael Burleigh, owner of the Horse Boutique, is a Master Saddler and Qualified Saddle Fitter for the Society of Master Saddlers. Michael is highly experienced in the art of saddle fitting. He is passionate about his craft and believes that a well fitting saddle supports, nurtures and benefits both horse and rider. Michael has honed his technique working with a wide range of horses, from high level eventers through to sturdy horses eager to trek around the hills of Herefordshire and Mid Wales. The Horse Boutique also offers an in-house, competitively priced, Horse Rug Cleaning, Reproofing & Mending Service. They can manage anything from one-off rugs in need of attention after a long winter, through to larger quantities from yards and riding schools. 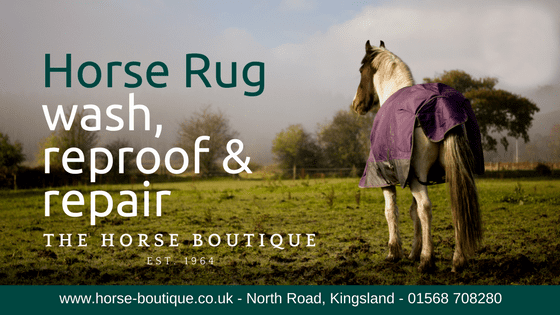 Visit: Horse Boutique, North Road, Kingsland, Leominster, Herefordshire HR6 9SA.